I’m a little slow getting these entries about Taipei posted as I have a lot of video and was hoping to do some editing for each entry. That, however, isn’t going to happen. Tawn all wrapped up and ready to take on the cool weather in Taipei. Saturday morning after breakfast we took a taxi to Taipei 101, previously the tallest building in the world and still the tallest in East Asia. Taipei as a whole is pretty flat and spread out so there are few buildings – and none immediately nearby – that challenge Taipei 101 in any serious way. The morning, as you can see, was still misty with a light drizzle falling nonstop. In fact, the top of the tower was shrouded in passing clouds from time to time, promising a less than unlimited view. After debating whether it would be better to wait and hope for clearer weather, we finally decided to go ahead and ascend to the observation deck on the 89th floor as many tour groups were arriving. 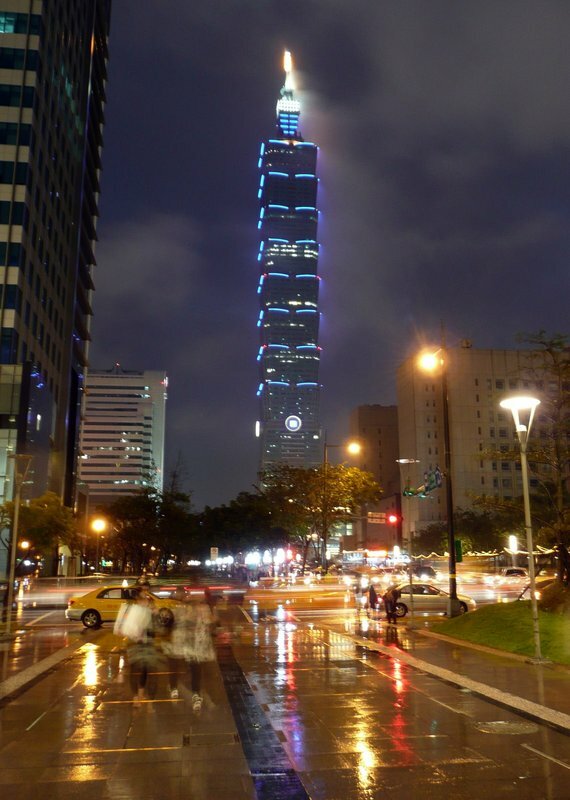 The design of Taipei 101 incorporates many elements of feng shui, the system of aesthetics that balances astronomy and geography to receive the results of positive qi, or energy. For example, the structure is built to resemble bamboo, a supple and quick-growing grass. There are lucky coins placed on the four sides of the building and the edges are adorned with metal embellishments that look like stylized clouds. It is actually a very graceful building. The elevators to the observation deck are supposedly the fastest in the world, reaching 1,010 meters/minute on the upwards journey and 600 meters/minute on descent. The ride from the 5th floor ticket queue to the 89th floor observation deck takes 37 seconds and, surprisingly, your ears don’t pop too badly thanks to a system of pumps that move air into and out of the passenger cab. The view from the deck was limited, although it was interesting to watch clouds blowing past the building below you. Also, there was one side of the building (the downwind side) where the clouds were stacking up behind the building. I did shoot some video, but nothing to share with you yet. 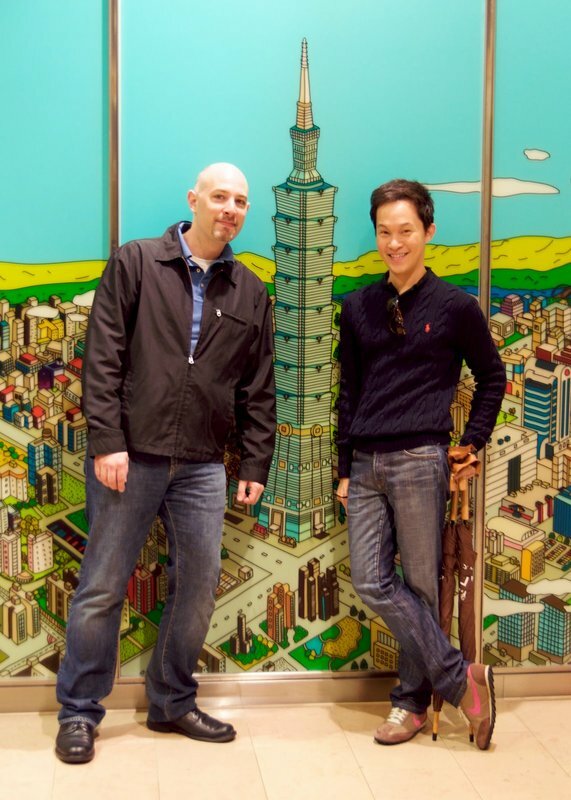 Tawn and I with a mural of Taipei 101 and downtown Taipei on a sunnier (and more cartoonish) day. 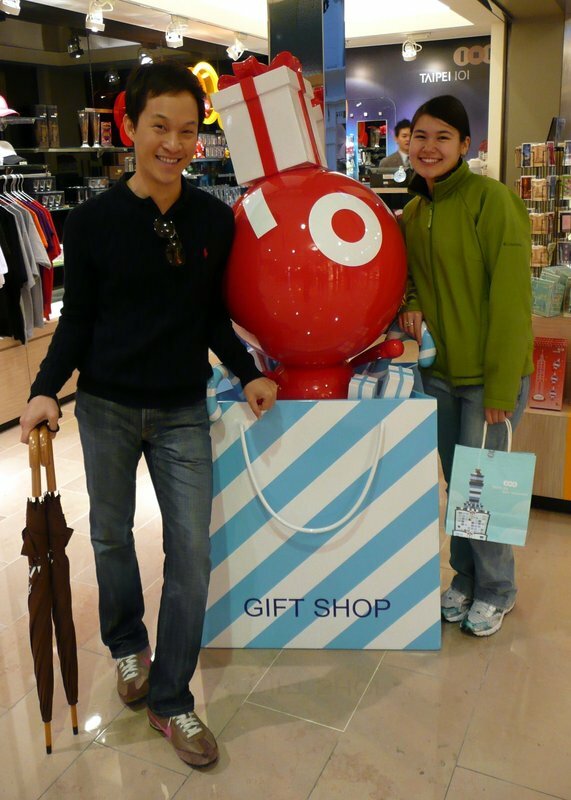 Below, Tawn and Sugi pose in the gift shop with a “damper baby”, the mascot of Taipei 101 whose image is based on the 660-ton pendulum mass damper that sways to offset building movement caused by earthquakes or strong gusts of wind. Notice that the eyes and mouth of the damper baby spell out “101”. 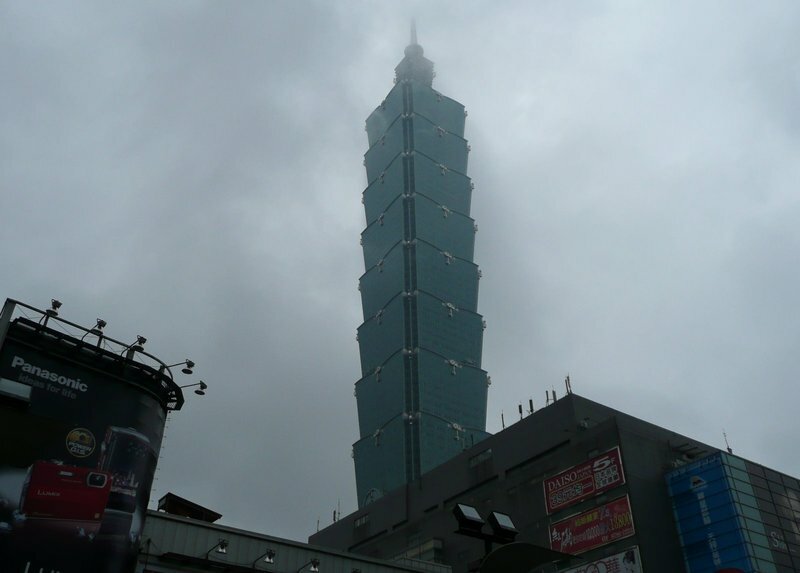 We spent most of the day in the malls surrounding Taipei 101, shopping and eating as there wasn’t a whole lot else to do on such a dreary day. That was fun enough, though, as it is about the company more than anything else. 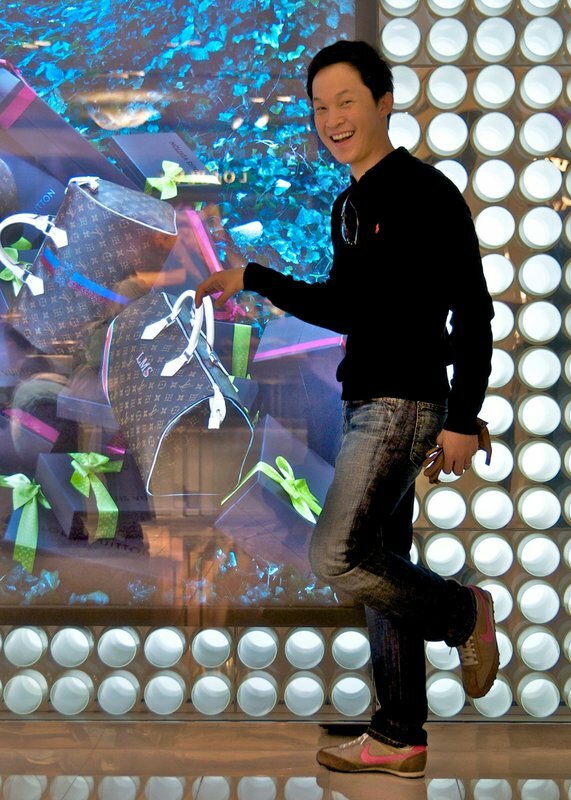 Tawn poses in front of the Louis Vuitton store’s Christmas display. Before heading out to the night market for dinner, I managed to get this decent shot of Taipei 101 at night, taken in front of Eslite Bookstore’s flagship location. More about the night market (which was drier) tomorrow. 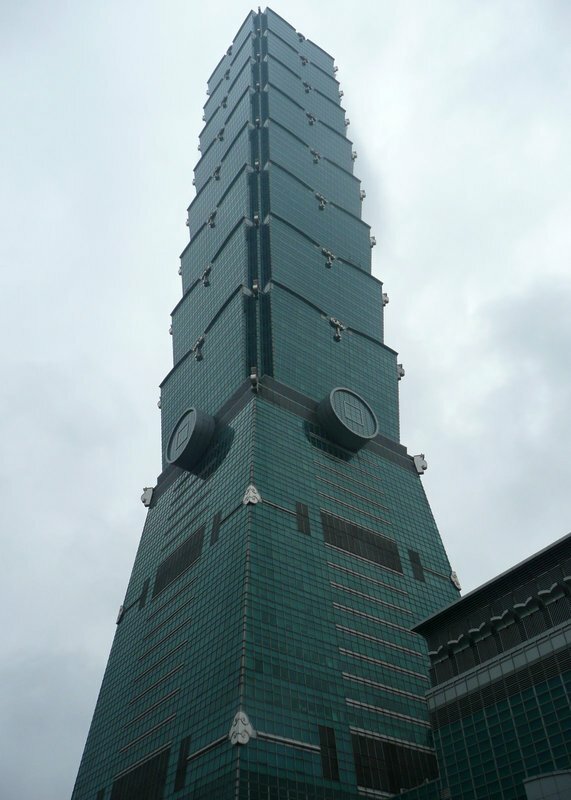 This entry was posted in Uncategorized and tagged Taipei, Taipei 101, Taiwan, travel by christao408. Bookmark the permalink. That is one beautiful building. I love the fact that the entire building has incorporated elements of feng shui in it. That is remarkable. Usually our homes and have that qi, which many westerners and south east asians have learned from the chinese. The night shot is very pretty Chris. Great photos. I love the architecture of the building. I once heard a student’s oral presentation about feng shui and he stated that it was based on old traditions and that the youth no longer adhere to in the modern culture. I often wondered if that is true and if feng shui is loosing its popularity with the younger population? Nice … It’s tough to catch a perfectly sunny day to take pictures while on a short holiday. The last picture came out nicely. Nice shot of such a tall building, especially the last photo! Tawn has been such a good model! LOL. Expecting the same when in HKG? That cartoonish shot by Andy is cute. =) Too bad the weather wasn’t too nice, but I’m glad you guys made the most of it! How is the shopping there? 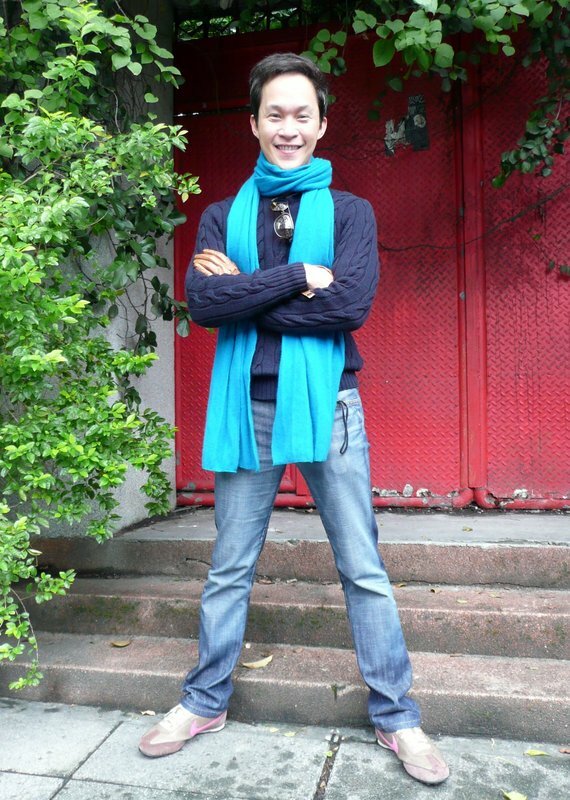 I need to go visit Taipei soon – this is when I am envy you that you can get there easily – in couple hours? @YNOTswim – Three hours with a choice of five airlines offering nonstop service. @lil_squirrel4ever – Shopping is quite good – lots of variety and prices seem reasonable. Everything from high-end to youth fashions to nick-knacks. @CurryPuffy – Yes, indeed. You’ll be taking the shots with your great camera, right? @TheLatinObserver – Well, especially at this time of year! @Roadlesstaken – It turned out pretty nice considering I was just resting it on the side of a column, not using any tripod at all. The ones Andy took turned out better but with a shorter shutter speed, lack the blur of the pedestrians. @Art4ArtSake – When it comes to building and architecture, the principles of feng shui still seem to be very much in use. Some of it comes from very practical ideas, such as not locating your building at the receiving end of a T-junction. “Bad qi” in that case also translates to “vehicular accidents in front of your entryway”. @ZSA_MD – Glad you liked the night picture. Yes, the incorporation of concepts of feng shui can benefit any home regardless of culture. The building looks so beautiful. I like the last night shot; something very dreamy about it. Yeah too bad you guys couldn’t see the city of Taipei on a nice day from 101.I’ll try to hit it again before I leave and post some pics of the view from up top!It is actually sunny today but already too much commitment with family. I miss Taipei. I really do want to move back. Let me know if you want any restaurant recommendations. I visited 101 in the evening time last month and did not see much. A far cry from the Eifel Tower (Paris) evening view. I was lucky that I visited 101 during the day a year ago, it was clear and the view was gorgeous! The lessons learned was the best time to visit 101 would be on a clear day! Glad you and Tawn made the best of it by visiting the huge mall below. I had a great time window shopping there also. For those who plan to visit it sometime: there is a nice food court at the basement level and there is free shuttle to a nearby “subway” station, as an alternative to taxi. Enjoy your travel blog a lot. What a cool building! The way that they mimicked bamboo is really, really cool. I’m going to have to show this to Phil! I love that last picture! Totally captured the spirit of the city. Awww I miss Taipei! Cute pic of Tawn holding the bag. I didn’t know about the coins on the building!! @brooklyn2028 – Easy city to miss, isn’t it? @Rm2046 – Yes, upon reflection it really does capture the spirit of the city. @TheCheshireGrins – For a skyscraper it is more interesting than most. @stevew918 – Taipei’s lack of tall buildings and distinctive buildings makes for a kind of boring skyline, I agree. @Redlegsix – Grab your passport and get on a plane! =D@LostSock21 – I’m always open to restaurant recommendations, although I’ve actually been back in Bangkok for three days now! @CurryPuffy – Next camera I get I want 24mm. @ungrandvoyage – While the skyline isn’t that impressive the city itself is wonderful. @Dezinerdreams – Clouds and a little bit of time exposure definitely add to that dream-like effect. Came back with Phil! He loved it! @TheCheshireGrins – Very good. Glad to hear it. @Wangium – Absolutely. You’re going to be back there next month, why not stop by for the view?